Round 14 of the 2018 IndyCar season was red flagged in its early stages following a huge crash. 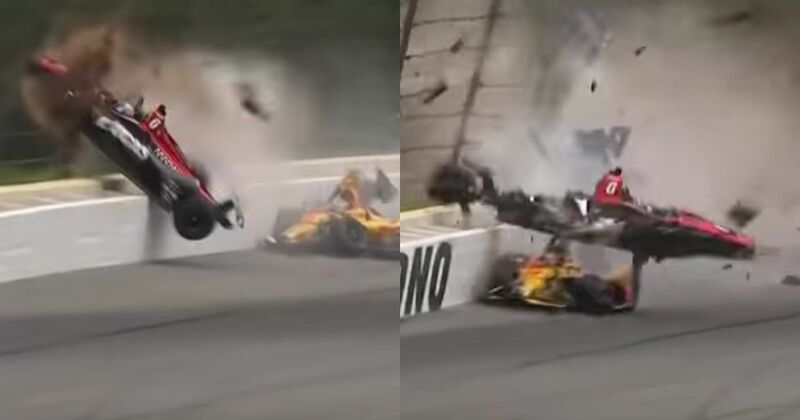 Contact between Robert Wickens and Ryan Hunter-Reay launched the former’s car into the catch fencing at Pocono, and we have to warn you - the violent impact is horrifying to watch. Wickens was airlifted to hospital, and soon after described as “awake and alert” by IndyCar vice president of communications Curt Cavin. It’s since emerged that the Canadian driver broke both legs in the accident, along with his right arm. He’s also been left with an injury to his spine and bruising to one of his lungs. Wickens is expected to undergo surgery at Lehigh Valley Hospital. The race was stopped for two hours while the damaged catch fencing was repaired, with Alexander Rossi dominating proceedings following the restart. He took victory ahead of Will Power. We wish Wickens a speedy recovery.